My first xmas card this year, I'm so far behind, I generally try to start making them around March, now I'l have to get a shift on. I bought a Kanban kit a couple of years ago and never got around to using it at all, I wanted something quick and easy so this seemed ideal and is my DT card for My Time to Craft this week where the challenge is Christmas in August. Great card hun, love the shape & of course the colour lol! Gorgeous card, love all the shades of purple together and it is a great shape too. p.s sorry I never got round to you last fortnight, I am now following so miss anymore lol. Great job, love the shape and colors. Thank you for playing along this week at OSAAT. I sure hope to see you back again very soon. this purple Christmas card is just lovely, I would never have imagined purple to be a Christmas colour but it certainly works. Love the purple and green for a Christmas card. The recipient of this card is very lucky/ Thanks for joining us at One Stitch at a Time this week. Pretty, love the color selection! Thanks for playing @ CTO! Great Christmas colours for this fab card . Thanks for sharing on Make it Monday . Love the non-traditional colors! Thanks so much for sharing with us at Celebrate The Occasion! 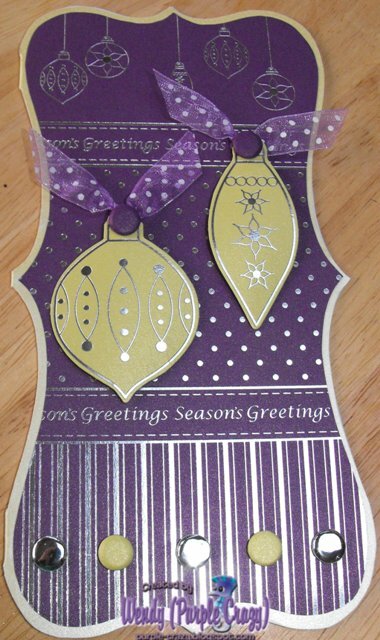 Beautiful card....love the purple and gold. Love this colour combo, fab card! Thanks for playing at One Stitch at a Time this week. Love the rich purple colors- beautifully done! I found you at MIM! Wonderful card! Those ornaments are great!